No work has been put into defining what is needed and then seeking that out in the candidate pool. In many instances, companies go back to one sourcing approach, for example posting an ad on their website or an internet job board. Or they rely too much on employee referrals. Don’t get me wrong…referrals are a great source and you should use them, just be careful about overusing them to the point that your employees don’t bring the breadth of skills needed for today’s jobs. There’s no process. 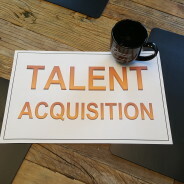 There isn’t a defined process for determining headcount needs, much less a recruitment strategy. This can lead to results no better than random…here you would save a lot of time simply flipping a coin when making hiring decisions. Looking for the purple squirrel. The ‘purple squirrel’ or ‘unicorn’ is what recruiters refer to as the mythical candidate that not only has all the characteristics being sought by the hiring manager, but also possesses others that can be contradictory or well beyond the needs of the job. Think: CNC machinist with a PhD or the executive-level finance leader who will also be the payroll processor. Not being clear on ‘need to have’ versus ‘nice to have’. People may not distinguish between what is mission-critical [required] in a candidate versus what is preferred [nice to have]. Wasting time on the nice-to-haves can divert you from moving on good candidates sooner. In our next posting, we’ll discuss some ways to help you find the right people for your business and strengthen your recruitment process. Check back later this week for Part Two!